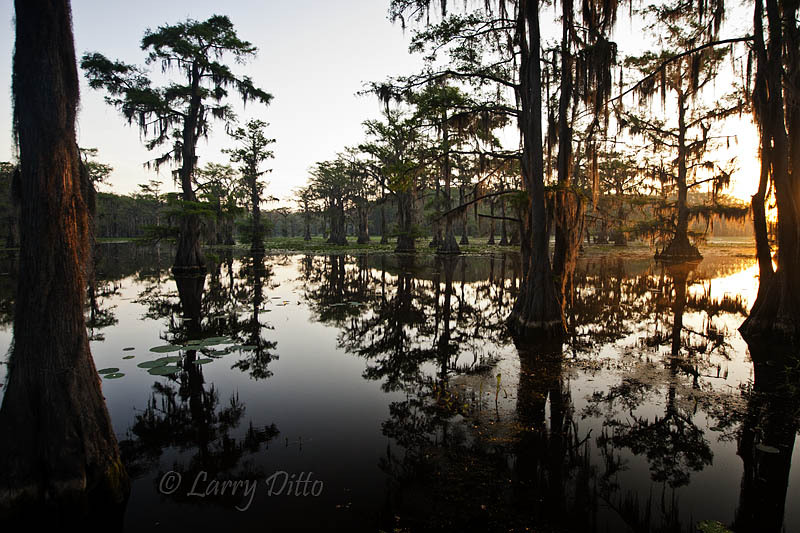 It’s time to catch you up on what happened at Caddo Lake in early May. As most of you know, Texas had a blistering hot spring which certainly affected the bird photography. 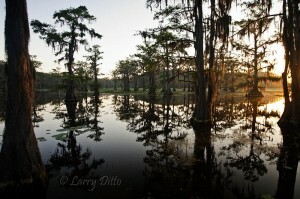 Early May at Caddo Lake is usually mild and quite enjoyable, but this year it felt like August. The birds responded to the unusually high temperatures by moving on or breeding earlier than usual. Nevertheless, we had a great shoot. Check out the photos below to get a better idea of the great potential this lake has for photographers. Remember, click on the upper right portion of a photograph to make it larger and sharper for better viewing. You may also advance through the slide show by clicking on the upper right portion of a photo. Sunrise through the Spanish Moss and Cypress. Each morning and evening presented many opportunities for landscape photography amid the thousands of bald cypress hung with Spanish moss. This shot was made from the landing of a boat dock just across the road from our cottage. Water lilies cover hundreds of acres in part of Caddo Lake near the town of Uncertain, Texas. 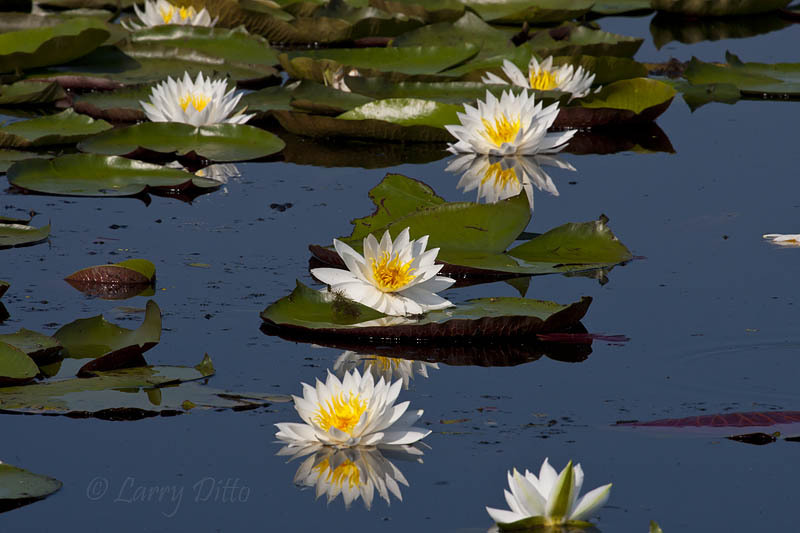 This photo was done from the boat deck, but I made several lily shots by holding the camera over the side near the water surface while watching the “live view” screen to level the shot. The depth of field and other settings were determined in advance so that all I had to do was get the composition set and trip the shutter. A 45 degree viewfinder would have been nice. 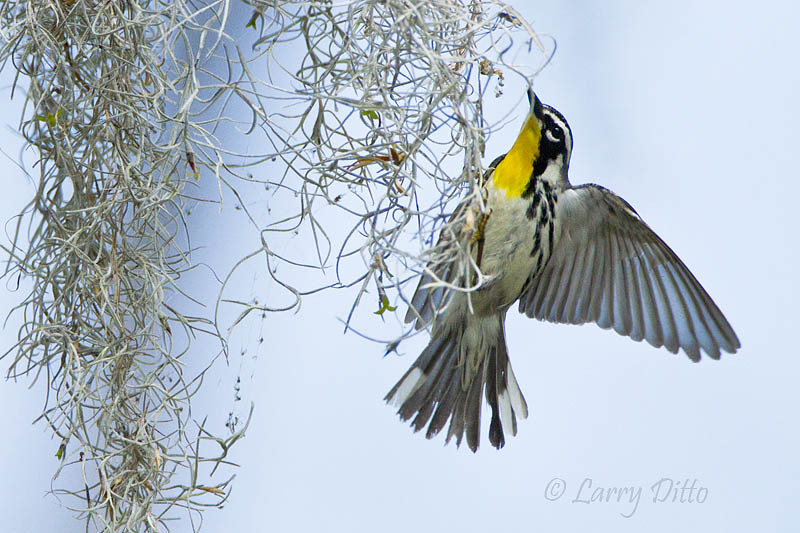 Yellow-throated Warbler extracting a spider from Spanish moss. 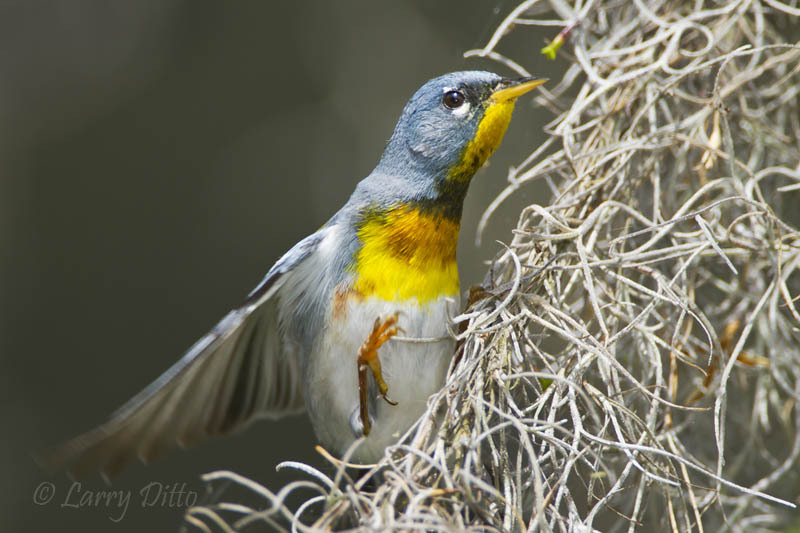 Three species of warbler (prothonotary, yell0w-throated and northern parula) nest at Caddo Lake and we got all three during this workshop. 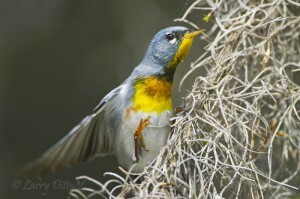 Northern Parula searching for invertebrates hidden in the Spanish moss. 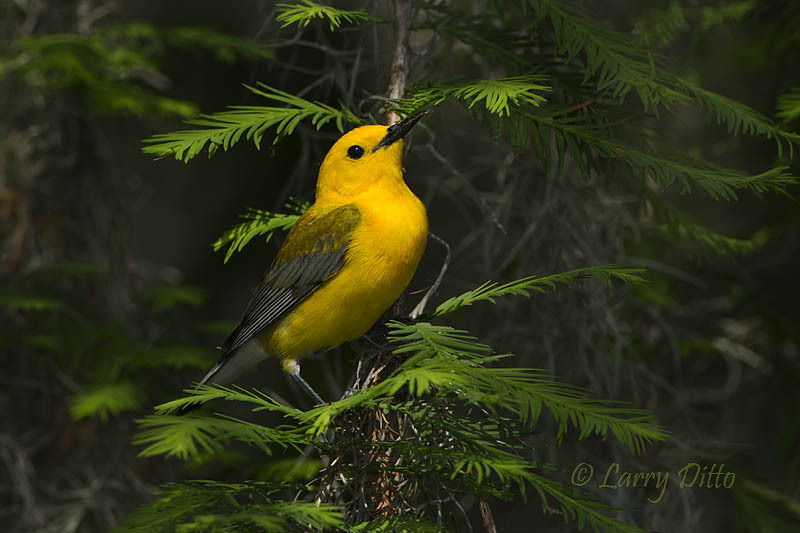 Most of my warbler shots were made with the Canon 7D camera, Canon 500 mm IS lens and 1.4 X teleconverter mounted on a Wimberley head and Gitzo 1348 tripod. 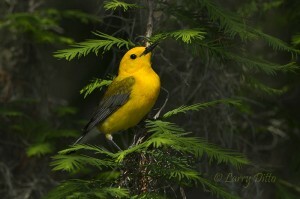 Male prothonotary warbler perched in new bald cypress leaves. 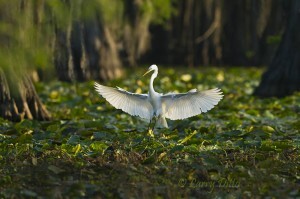 Some photographers elected to pursue some of the more uncommon birds and passed up opportunities to photograph herons and egrets at Caddo Lake. These birds are numerous, but working to get good images of the elegant birds is always fun. 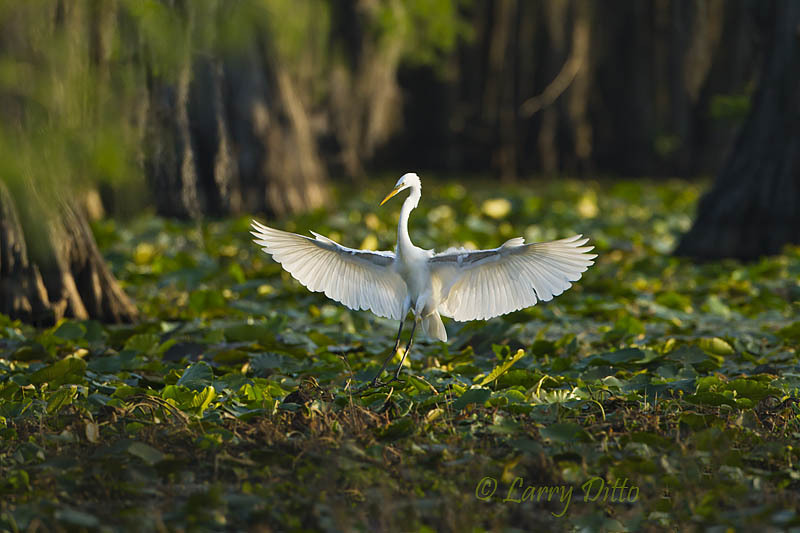 Great egret landing in water lotus at sunrise. 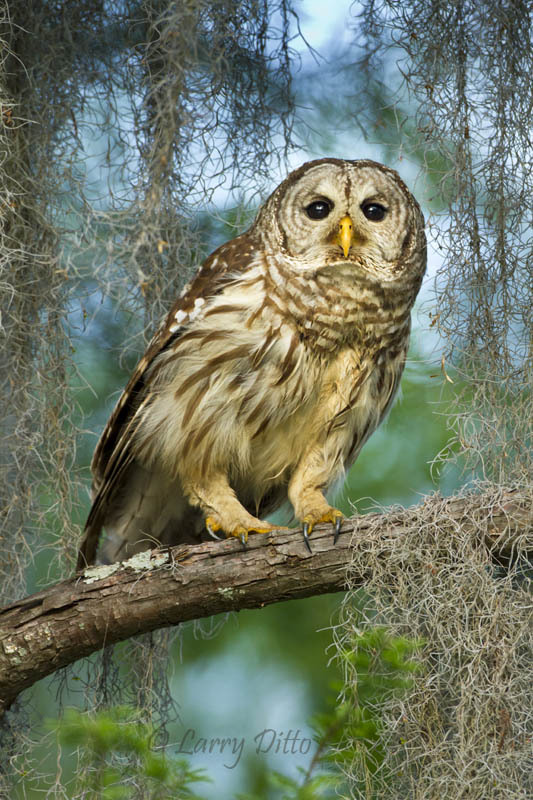 Barred Owl preparing for flight from a perfect perch where he was framed in Spanish moss. 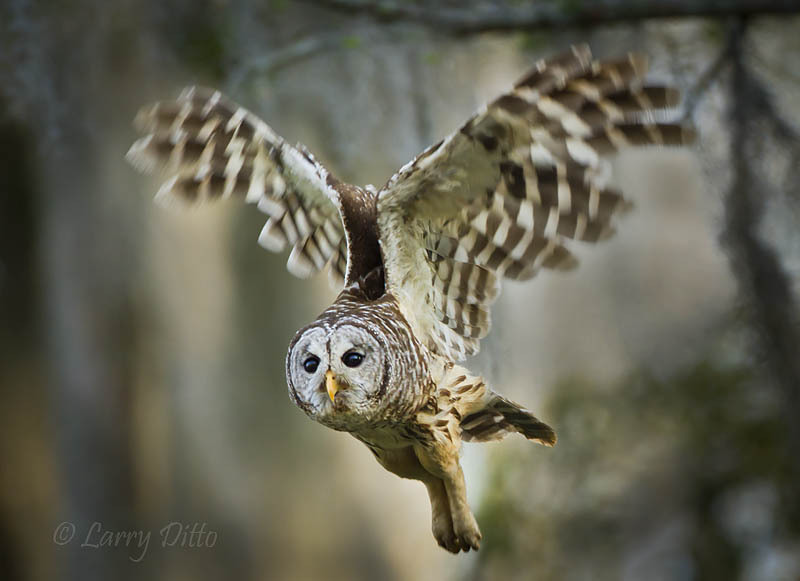 Over the years, I’ve been able to get my photographers lined up for some great barred owl shots. This spring, the birds were especially cooperative and everyone had many excellent opportunities to capture images of this splendid predator. 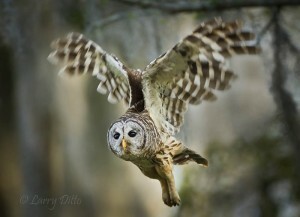 Barred Owl flying past our boat in late evening light. In late May, I had an opportunity to photograph some ocelots in “controlled” conditions. 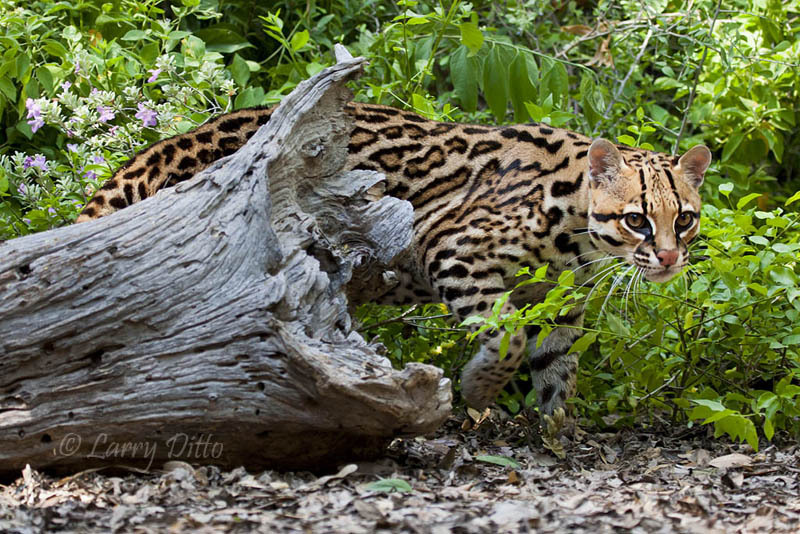 Working with another photographer, we were able to establish a “set” with south Texas plants that occur in good ocelot habitat. 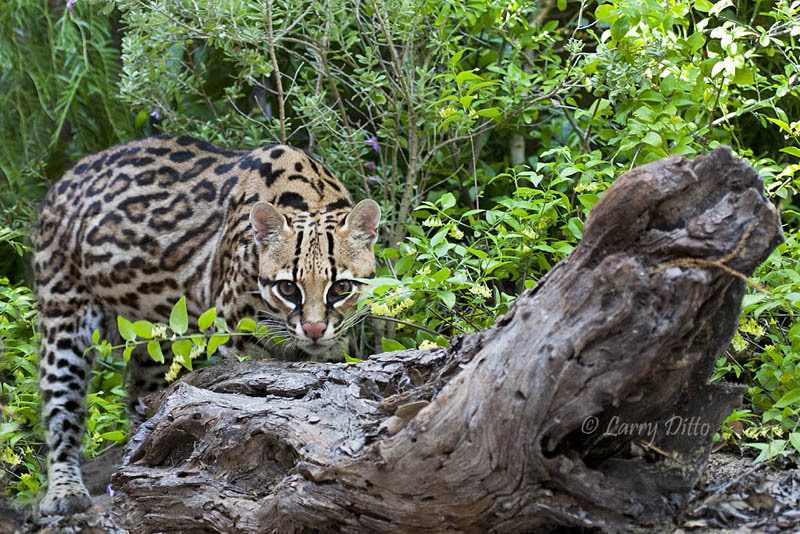 Ocelot emerging from dense thorn-forest cover. Endangered ocelot crouching behind a log in south Texas thorn-forest habitat. Ocelots are about the size of a bobcat and their markings provide superb camouflage. 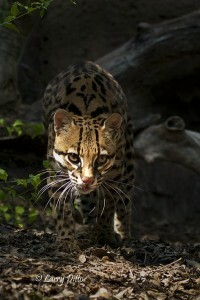 Ocelots are seldom active in daylight hours. 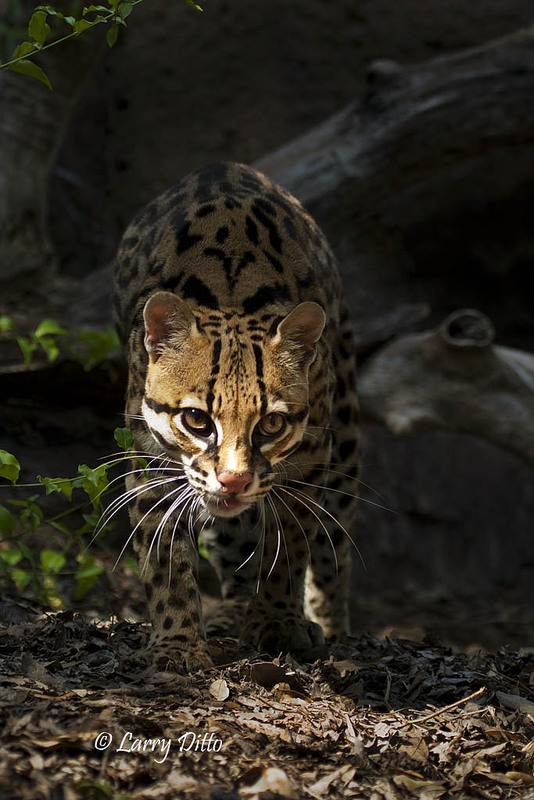 I would love to tell you this mammal can be photographed in south Texas where 30-80 of them still survive, but that isn’t likely. A few lucky persons have seen them in the wild. 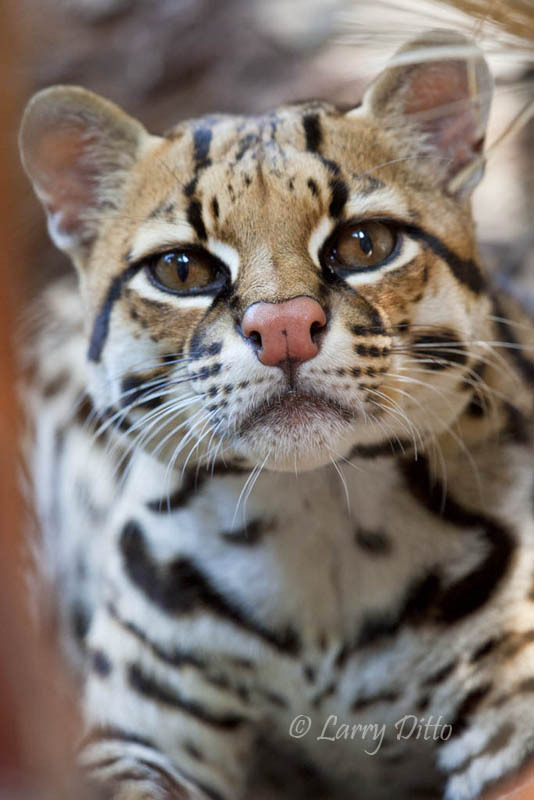 So far, the mostly nocturnal felines have refused to pose for photos. Check out next week’s newsletter when I will take you to a south Texas ranch with two photographers who were amazed at the numbers of painted buntings and other colorful birds just waiting to be photographed. Paul Denman (pdenman@mac.com) has the following used items for sale – Canon 1D Mark III body; Canon 5D Mark II body and battery grip; Canon 70-200 f2.8 lens. Hal Mayfield (hmayfield@dfw-mail.com) has these used items for sale – Nikon Coolscan 5000 ED film scanne; tiffen step-up rings (72-77, 62-77, 58 – 62, 55 – 62, 52 – 62); tiffen 3X4″ graduated ND filters (#6 and #9); a variety of other filters, holders, filter pouches; a flash modifier, Bogen super clamp; Nikon MC-36 multi-function remote cable. Contact Hal for more details and prices.